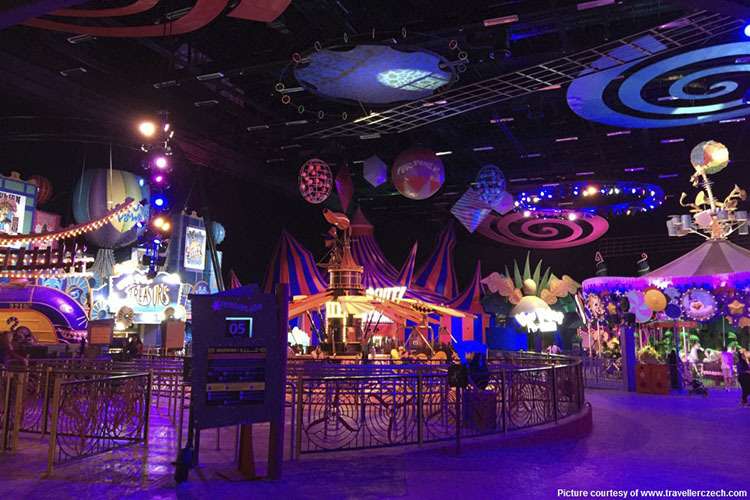 On the back of their successful installation of SkyDeck at Motiongate Dubai, J&C Joel were commissioned to design, manufacture and install a circus tent at the Hollywood-inspired theme park. Motiongate Dubai is part of Dubai Parks and Resorts, a new ground-breaking $2.86 billion multi-theme park complex, which is set to become the city’s hottest new attraction. At more than 25 million sq ft it will be the largest integrated theme park resort in the region. The site includes three theme parks and one water park – Motiongate Dubai, Bollywood Parks Dubai, LEGOLAND Dubai and LEGOLAND Water Park, side by side. The theme parks are then connected by Riverland Dubai, a grand entrance plaza, and Lapita Hotel, a Polynesian themed resort. 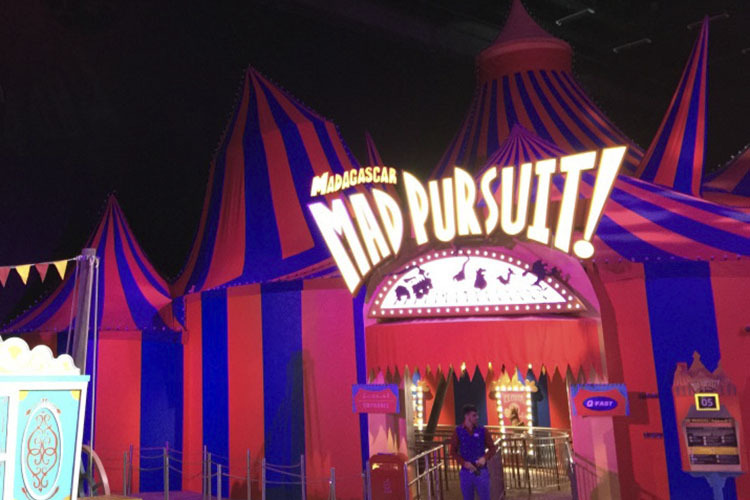 The concept involved J&C Joel’s manufacturing team creating a circus tent that was inspired by the animated film Madagascar. It required six uniquely shaped tops and included designing the steel structure for the fabric to fit around and tensioned to the desired shaping. 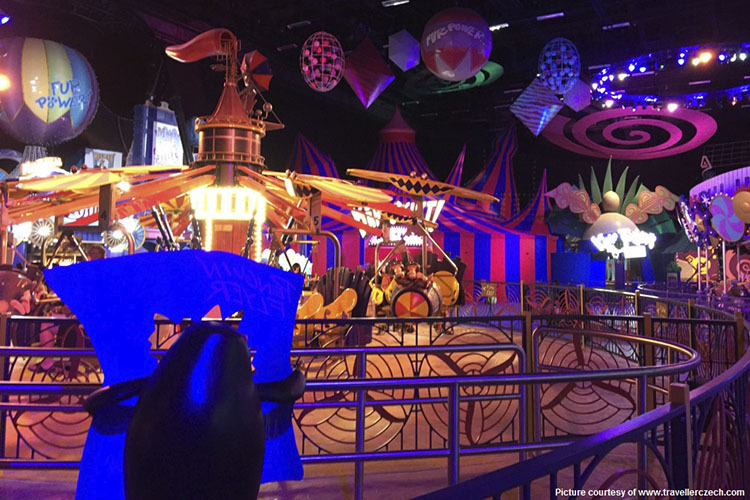 The tent, which is the entrance to a ride is based in the film’s section in the DreamWorks part of the theme park. J&C Joel’s Creative manufacturing team, led by Andrew Hastwell, came up with a design concept for the tent and the bespoke steel frame structure to hold it up. They quickly outlined the method and technology required to make the tent. They identified that the best fabric to use would be Poly Twill because it is lightweight and has the appropriate stability which makes it a considerably effective fabric to be used to fit around structures with the added benefit of being inherently flame retardant. The fabrics chosen were Royal Blue Poly Twill (PTW001) and Carmine Poly Twill (PTW006) to replicate the tent featured in the animated film Madagascar. To achieve the shapes required each individual piece of the tent was cut by hand and then sewn back together by the manufacturing team’s talented seamstresses. Each section of the tent was created individually and then installed on site separately. Once in place on site, each section was then sewn together from a cherry picker to give the overall tent shape that was desired by the client. J&C Joel’s expert team also worked closely with the steel frame manufacturer and installation team on site to ensure it came to the desired shape. The creation of the tent took more than 400 hours of work by J&C Joel’s cutters, seamstresses and the creative manufacturing team and around 1200m of fabric was used. The installation took three weeks with a dedicated team on site throughout to ensure it went smoothly and was completed to the clients’ specification. Andrew Hastwell, Creative Manager at J&C Joel, said: “The project has been a massive undertaking for the whole team. But manufacturing the tent into sections made for a smoother installation and delivery of the tent to site. “It was an extremely unique project to work on but our experienced team worked together to ensure it went smoothly and the clients brief was achieved. It was very testing from concept to delivery but we thrive on challenges and the result is fantastic.